Thoracoscopic enucleation of leiomyoma of the esophagus was successfully performed in 5 cases. This paper mainly describes a 51-year-old man who was referred to our hospital in April 2008 for further examination and treatment, because submucosal tumor of the esophagus was increased in size in 3 years. Esophagoscopy showed a mass beneath normal mucosa located at 23 cm from the incisor teeth. Endoscopic ultrasonography showed a sharply delineated low echoic mass with calcification measuring 6 cm along the axis. The lesion was diagnosed as leiomyoma. The operation was performed in July 2008 under general anesthesia keeping the patient on the left lateral position. A double lumen endotracheal tube was utillized and the right lung was collapsed. Five trocars were inserted through right intercostal spaces for operation. The azygos vein was dissected and divided by an EndoGIA. 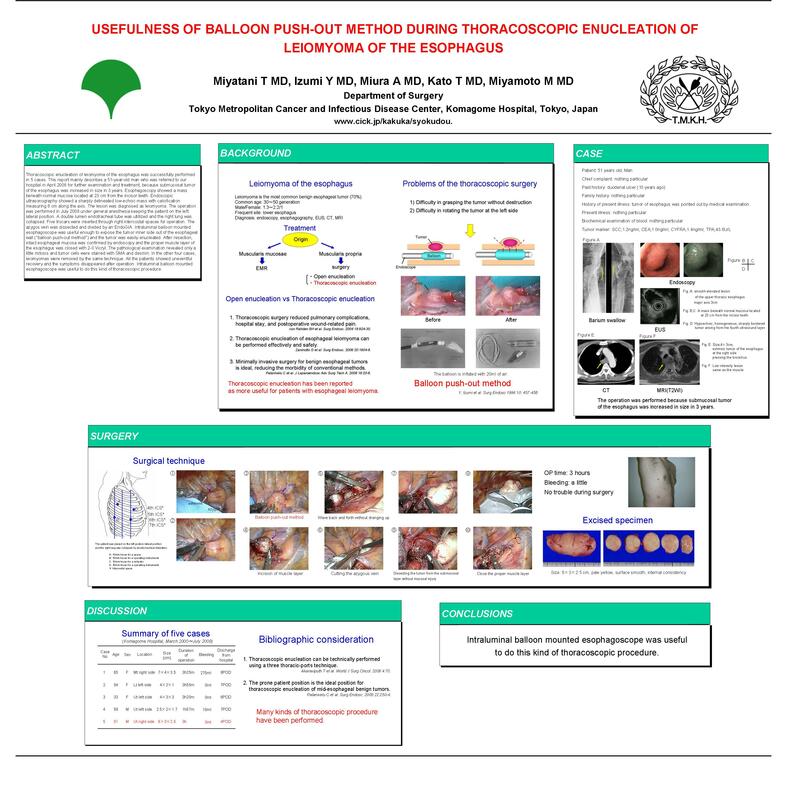 Intraluminal balloon mounted esophagoscope was useful enough to expose the tumor inner side out of the esophageal wall (gballoon push-out methodh) and the tumor was easily enucleated. After resection, intact esophageal mucosa was confirmed by endoscopy and the proper muscle layer of the esophagus was closed with 2-0 Vicryl. The pathological examination revealed only a little mitosis and tumor cells were stained with SMA and desmin. In the other four cases, leiomyomas were removed by the same technique. All the patients showed uneventful recovery and the symptoms disappeared after operation. Intraluminal balloon mounted esophagoscope was useful to do this kind of thoracoscopic procedure.